One educational blog that I consistently read is Burkins &Yaris Think Tank for 21st Century Literacy. 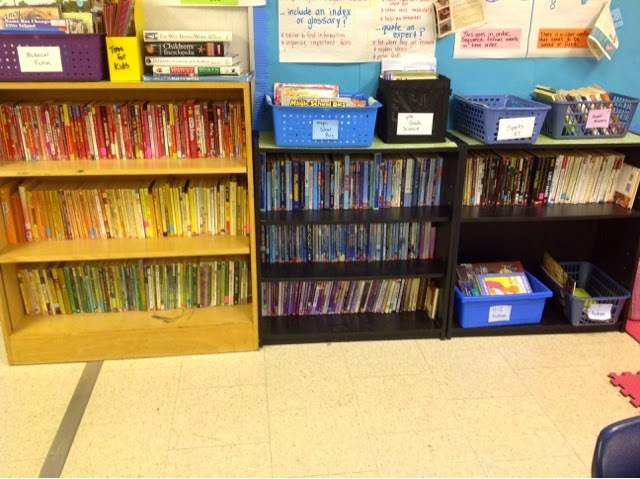 My classes are currently participating in a bit of action research by organizing our classroom library as suggested in the Burkins &Yaris blog post What Color is Your Library? We took all of the leveled chapter books out of their labeled baskets and arranged them according to color. Our book shelves are now a reading rainbow! 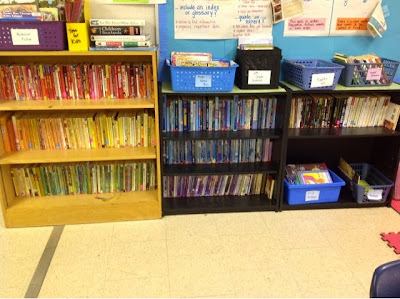 At one point in my career, I had very rigid ideas about how a classroom library should be organized (which included ideas such as books must be organized in bins by author, topics of interest, or genre). Your experiment has reminded me how important it is to experiment and the common denominator of success is this: intention. Do we know what we're doing and why. I love that you've tried something new and I love how this experiment seems to have acquainted students with books they may never have found otherwise. I hope your spirit of innovation becomes contagious! Thank you for your inspiration and ideas. I am getting ready to share lessons with my students using the book Fifty Cents and a Dream. Your insight into the book is what made me choose it. Check back for my blog entry on that! I am a third grade teacher. I teach Literacy and Social Studies. This is my 17th year teaching. I am National Board certified(twice)as an Early Childhood/Generalist. I earned my Master's degree in Elementary Education. This blog contains ideas for implenting a balanced literacy framework. I am proud of my unique and interactive ideas. Some ideas have come from many years of sharing with other teachers. I cannot take credit for all of these being original ideas, but all of them have been tweaked to fit the needs of my students.